When you come to Bridge Players we encourage you to make a night (or an afternoon) of it! There are many wonderful eateries close to the theater. Listed below are just a few. Check them out and consider stopping in for dinner before the show, or for a post-show treat. Roomy tavern paring comfort food staples & craft taps in lofty quarters with big screen TVs. A local pub focused on craft beers and an eclectic menu featuring award winning burgers. Our new patio bar is open with games, live music, and brunch on Sundays. A fixture on High Street in historic Burlington City for more than a decade, Legend's Tap Room is known for it's great selection and friendly neighborhood atmosphere. Casual American eats, cocktails & draft beers offered in a seasonal riverside venue with live music. Sandwiches and wings. American comfort food. An old fashioned ice cream parlor that makes ice cream, sherbets and no Fat, no Sugar ice cream. They also have homemade waffle cones and homemade whipped cream. Enjoy Dinner & a Show! Make a night of it when you come to Bridge Players and enjoy dinner and a show! Bridge Players has teamed with Legends Pizza on High Street in downtown Burlington to bring you an incredible offer. 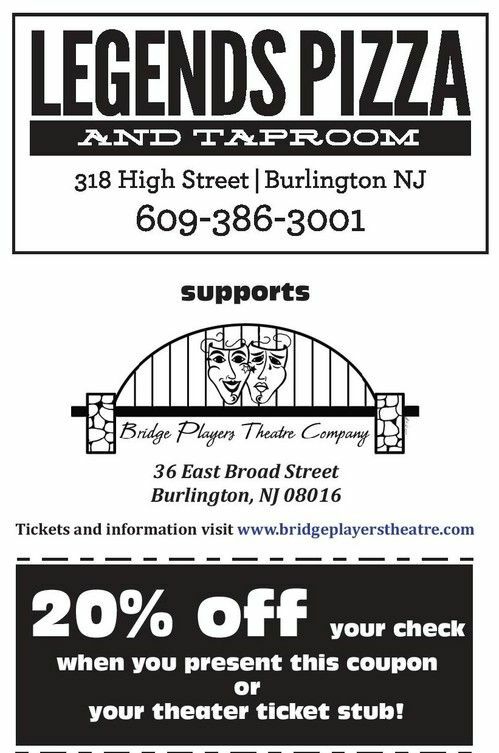 Just print off the coupon below, or bring in your ticket stub during the run of our shows and receive a 20% discount. Limit one per table.